The snowman glass ornaments are a great holiday project for girls of all ages. Younger girls may require a bit more help with shaping the clay pieces, but that’s where the creativity can come through. The project takes about 30 minutes, baking included. Knead clay for 2 minutes before shaping. Remove metal cap/hanger from the ornament. Remove the wire hanger from the cap and set it aside. Make a red clay disk slightly larger than the diameter of the ornament cap. Wrap the red clay disk around the edges of the ornament cap. Using the 2 mm pointer tool from the starter set, poke holes through the red clay so the holes in the cap remain open to replace the hanger later. Make 2 wide red strips for the headband and 2 large red domes for the ear muffs. Then make 2 medium black disks for eyes and 3 little disks for the mouth. Make 2 tiny white eye highlights and an orange cone shape for the nose. Place the face pieces firmly onto the ornament, making sure each piece follows the curve of the glass. With the blunt point tool from the starter set, texture the ear muffs. With the flat knife tool, texture the nose. Make sure the clay covered cap will go back on and that the ear muff headband does not interfere with the fitting of the cap. Bake on oven-proof glass or metal surface at 275° F for 15 minutes per 6 mm of thickness. To keep the ornament from rolling around in the oven, make a little bowl from foil for it to sit in. Allow the ornament to cool completely, then gently remove the clay pieces. Glue them back on permanently and allow to dry. The clay cap covering will not need to be glued on. Replace the wire hanger into the holes of the cap. Fill the ornament with the white tree garland. Replace the cap and add the ribbon. Do not use unbaked clay on unprotected furniture or finished surfaces. Good working surfaces include glass or metal, disposable foil or wax paper. Do not use a plastic ornament or it will melt in the oven. Glass only. All banking should be completed by an adult. 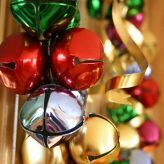 This Jingle Bell Wreath is a great holiday project for older girls. Depending on how well your girls’ motor skills are, you might attempt this project with a younger set of girls, but try doing this yourself to see how difficult it is for you before having girls attempt it. Make a circular loop with the heavy gauge floral wire. String bells along wire and fit them closely together around the length of the loop. Use a pipe cleaner to wind around the bells at either end of the loop to hold the wreath shape together in a circle. Tie a bow around a pipe cleaner and then tie that pipe cleaner around the part of the loop that was joined together. Have all the materials ready before beginning the project. Stadium pillows are a fantastic project for any troop of any age. While my directions mention a football design, you can customize it for any sport and use any combination of colors to represent either professional, local teams or the girls’ school colors. 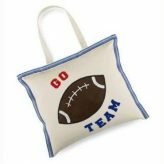 The project is designed to be glued together, but if your girls are older you could easily alter the directions to sew the seams of the stadium pillows instead of glue. Reference this post from Scrapbooking.About.com for a football pattern. Cut the tote bag along the side to open. Cut one handle from the bag. Draw a football with the pencil in center of tote. Have an adult follow the directions on the letters and iron the letters onto the tote to say “Go Team”. Pour out a small amount of the brown and white paints onto a paper plate. Use a paintbrush to fill in the football design and let dry. Use white to make side and center lines. Using white slick paint bottle, draw stitch marks on the ball. Let dry. Glue sides of tote together, let dry. Fill opening with pillow form or Poly-fil and glue closed. Glue ribbon along sides and top of tote. Adults only should handle the iron and iron on the lettering. Personalized Ribbon Keychains are an all-ages project, suitable for both young girls and still a fun, quick project for older girls. These instructions on aimed more for younger girls, but older girls can easily also do this project with access to more craft supplies to snazzy up their key chains a bit more. This can easily be done in 30 minutes and is very clean, as long as the fabric paint is kept under control by younger girls. Ribbons – 28″ of one and 4″ of another. Cut a piece of ribbon 28″ long and two coordinating pieces 2″ long. Slip the key ring onto the long piece of ribbon. Fold it in half over the key ring and glue the ends together. Use the small pieces of ribbon to wrap around and glue over the seam of the other ribbons. Lightly draw the name onto the ribbon. Use the dimensional fabric paint to personalize and let dry. This Clay Heart Necklace is a super girly project, and should be best suited for older Brownie and Junior troops, ages 9-12. It’s a little messy, so make sure you have smocks or spare crafting shirts to cover up a bit. You should not use a toaster oven for this project that you actively cook in – it’s best to buy a cheap oven just for crafts or use an older toaster oven you plan on replacing in your kitchen. Some clays are toxic and render a toaster oven unsafe to cook food in from there. Condition the clay by kneading it in your hands. Roll out the pink clay to about 1/8″ thickness. Use the plastic knife to cut out the heart, smoothing the edges with your finger. Knead the lavender clay and roll it out into 1/8″ thickness. Cut a second heart, making it about ¼” smaller than the pink heart. Carefully place the lavender heart on top of the pink heart. Knead just a small amount of the black clay. Roll it out to about ¼”. Cut a strip of clay and wrap it around the edges of the lavender heart, making an outline. Use other strips to make a peace sign inside the lavender heart. Use a toothpick to make two small holes at the top of the heart. This is where you’ll later lace the ribbon through. ADULTS: Follow the directions on the clay packages and bake in the toaster oven for the time indicated. Let cool. Cut an 18″ piece of ribbon and thread one end through the hole at one side of the heart. Tie a knot. Tie a knot 2″ from the first knot. Slip on a pony bead and tie another knot so the pony bead is held in place by knots on both sides. Continue knotting about every 2″ and adding beads to the desired length. End by tying the ribbon to the second hole in the heart. You can also use cookie cutters on the clay, but they should not be used for food ever again once it’s used in a craft project. An adult should use the oven only and complete that step in the process.